H.E. 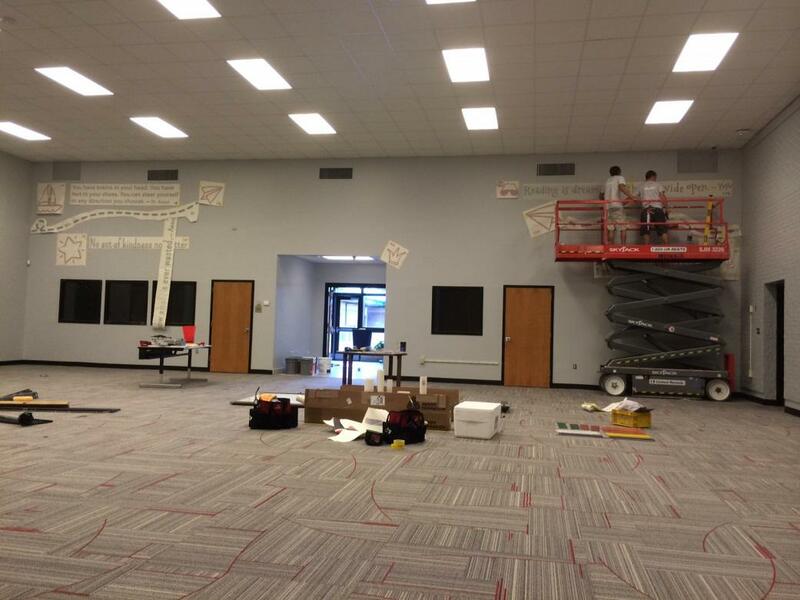 Bonner Elementary recently completed an extensive library renovation this summer and we were excited when they enlisted our help to spruce it up a bit. The Moncks Corner School was built in December of 1980 and hadn’t had a renovation since its doors first opened, so they were thrilled to have the opportunity to give the library a facelift. 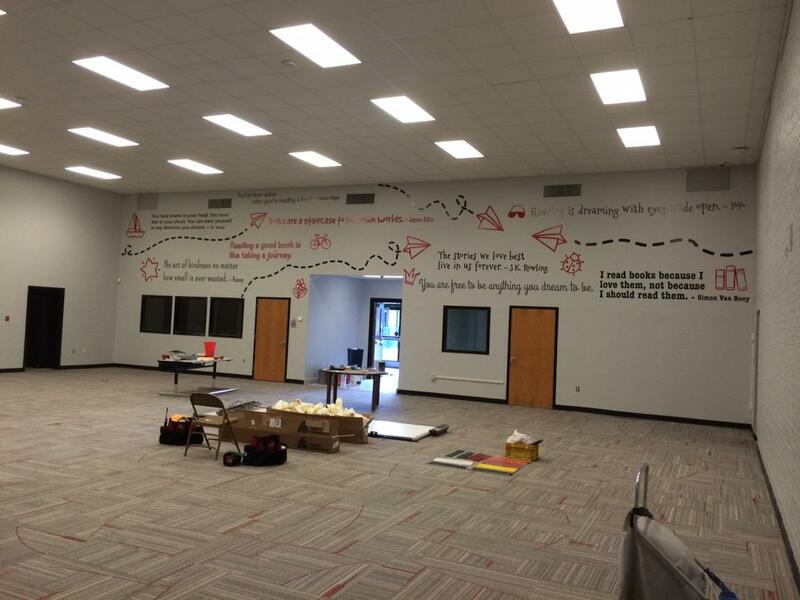 The large wall space above the entrance was calling out for something big, so we set out to design a modern and inviting wall mural to welcome the students to their media center. 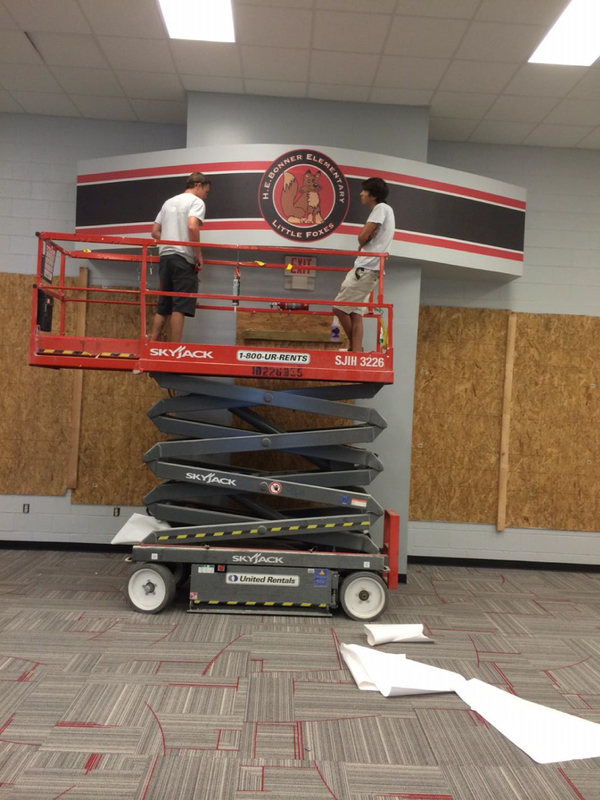 The Administration wanted the space to have an updated, modern appeal, so we incorporated the schools colors (black, red and gray) into a clean design that was also dynamic with plenty of movement. 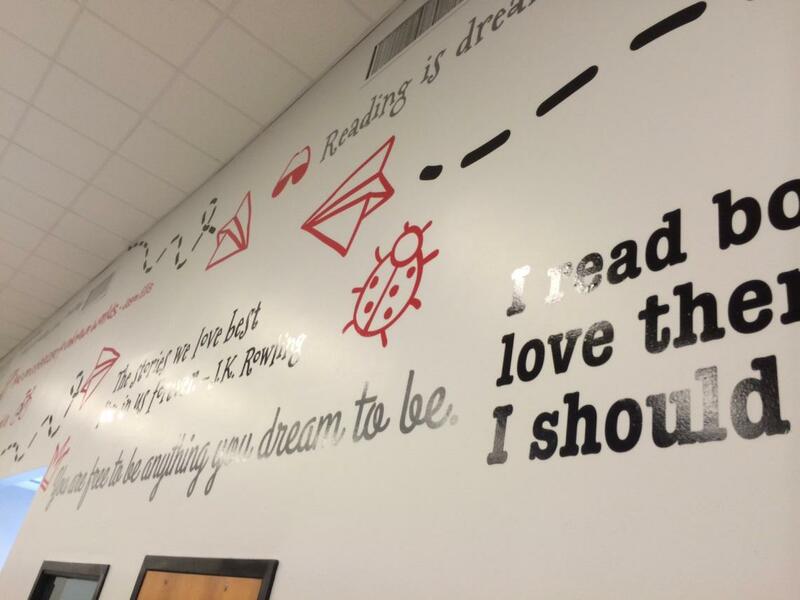 Our original sketches started with a simple quote, and as the process continued, we began incorporating additional words of inspiration about the love of reading, paper airplanes, and even some hand-drawn elements. After the final design was approved, we started the production phase. 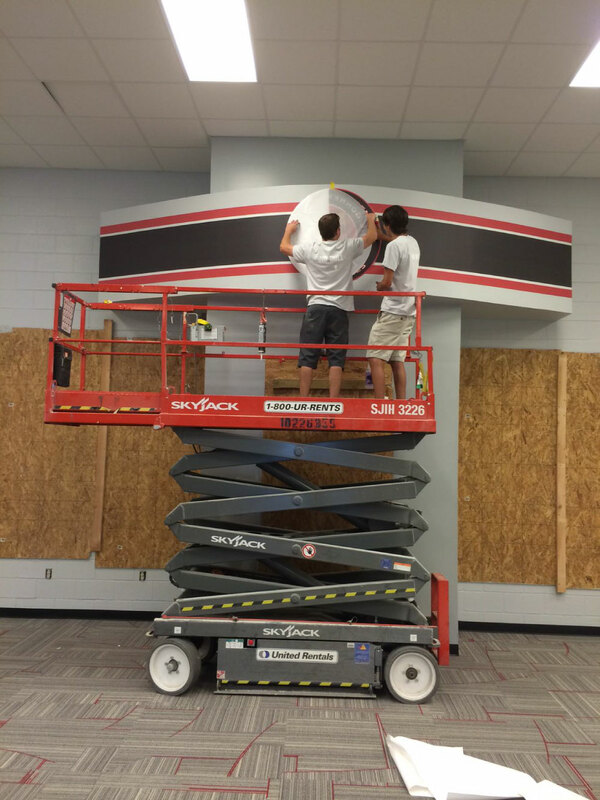 Cut vinyl was used because of its high impact with saturated colors and great long-term staying power. It was truly a team effort to produce the finished product and we all pitched in to prep for this uniquely large-scale project (thank goodness, because there was so. Much. Vinyl.) We put the Zund to work cutting the various shapes and letters. 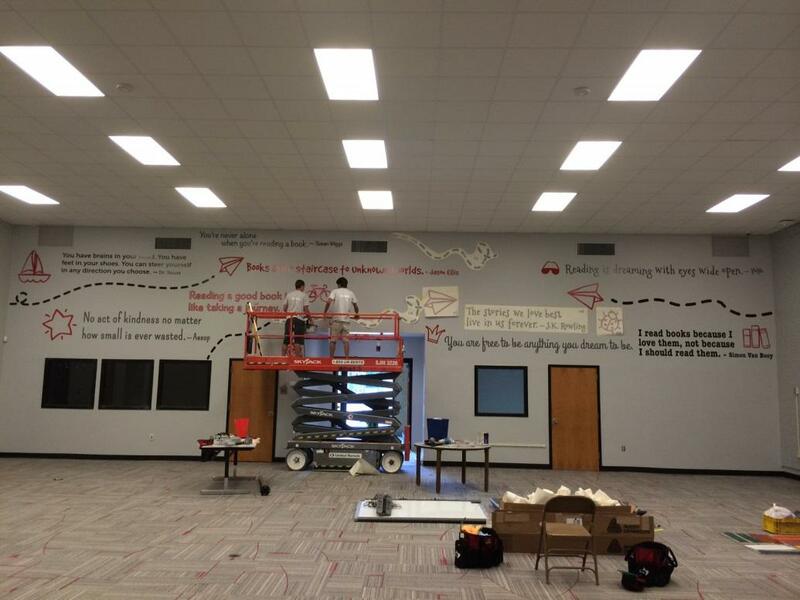 For the wall mural install, we used a scissor lift to reach all the way to the top of the enormous wall. Even though we painstakingly laid out the design, some on-site adjustments took place to decide where to place the various elements on the newly renovated wall. The entire process- from design discussions, a site-visit to take measurements and test the paint, to the completed installation- lasted from February through early July; a truly fun and unique undertaking that produced a finished product we’re sure the H.E. Bonner Elementary Little Foxes will enjoy when they return to school next week!